It's unbearably hot in L.A. today, so rather than suffocate in my stuffy little apartment I decided to cool my heels in an air-conditioned movie theater. I also had a free ticket, so what better opportunity to check out George Clooney in Leatherheads. My much anticipated pairing of two of my favorite actor guys--Clooney and The Office cutie John Krasinski--has not been a critical or box office triumph. The kindest review I read was Rolling Stone's Peter Travers gives it a solid three stars and says "He belongs to two churches — film and football — and George Clooney worships at both in Leatherheads, a scrappy debate on the rules we live by disguised as a screwball comedy." But most reviews were lukewarm, although willing to give Clooney a pass (pun intended), as with the Washington Post's John Anderson who wrote, "Clooney is the Peyton Manning of movie stars, so he's allowed to punt once in a while." So is the movie a touchdown or a fumble? Well, it's neither. It's more like a long, grueling drive down the field that has time running out just inches short of the goal line. Okay, that's enough of my football euphemisms. 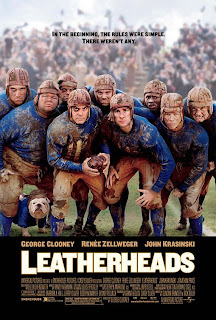 There are some great moments in Leatherheads; the opening depicts the disparity between the well-attended college football games vs. professional football showing the Duluth Bulldogs playing out in a rural pasture while a bemused cow watches. It's brilliant. Too bad there aren't more moments like it. Clooney also does too much telling instead of showing. It's a basic concept in filmmaking to not tell what you can show. And if you can show it, there's no reason to tell it as well. Shots of his team players going back to their old vocations after the Duluth Bulldogs go bankrupt are preceded by Clooney's character of Dodge Connelly saying something to the effect of "Well, I guess they'll go back to the mines or the fields." This wasn't the only instance where Clooney felt the need to EXPLAIN things to the audience. Tell us a story--let us decide what it means. Apparently Clooney rewrote all but two scenes of the script originally written by Duncan Brantley and Rick Reilly. When the WGA refused to give him a writing credit, he resigned from the Union and went FiCore. And who knows, maybe he vastly improved on the original script--but given the finished product, it would have been just as well his name's not on it. Leatherheads tries to evoke the wit and patter of a 1930s screwball comedy. And it tries a bit too hard at times. The banter is fitful and not nearly as sharp and smart as The Philadelphia Story or His Girl Friday. At the beginning of the film, everyone seems to be forcing the sparkle. For example when Carter Rutherford (Krasinki) vaults over a railing with ease. It comes off as contrived. By the middle of the movie, everyone is a bit more subdued and it works better. The subplot of Rutherford's war heroism may or may not have been necessary. I can see where some critics felt it unnecessarily complicated the plot, but the question of celebrity and of the public needing heroes and the media too happy to create them is an issue that is well worth exploring. Unfortunately, it's used as a clever little plot point to help our hero win his girl--completely disregarding the fact that the crowds generated by Rutherford's perceived heroism is what is galvanizing professional football. The weight of fame on Rutherford, beautifully evinced in Krasinki's eyes, is also given little play in the film. But then again, it was supposed to be a film about football--it's humble beginnings and how it eventually came to be the regulated, commercialized, hypefest that it is today. Clooney wanted to show what it was like when it was a GAME. And when the game was about having FUN. And this is where the film's biggest failing occurs. In all his scenes of the grit and grime of pre-commercialized football, we don't get to see the fun. All the oddball characters that make up the team are treated as mere filler--more like extras than characters. And the end of the film Dodge is faced with the choice of continuing to play professional football by the new rules or to have fun and get thrown out of the sport. The stakes are high, but as an audience we don't feel them. And all those now illegal plays like the "Pig in a Poke," "Rin Tin Tin" or the "Crusty Bob," we never got a chance to see them. The ending is clever but without the proper set-up, the payoff felt like a day late and a dollar short.